Meet us after work on the first Thursday evening of every month for a new kind of happy hour in Westchester! Anchored by ArtsWestchester’s contemporary art exhibitions, Gallery Nite Out at ArtsWestchester is a series of creative interactive events hosted in ArtsWestchester’s downtown White Plains gallery. Enjoy an evening with people who love the arts as much as you do! Special highlights throughout the series include live DJs, specialty tastings by local restaurants and more. All events will include: Amazing contemporary art, Wine, beer and light bites, Art activities inspired by ArtsWestchester’s current exhibition, A unique art gallery setting (check out the bank vault!) See all Gallery Nite Out events here. Ticket includes entrance to the event and exhibition, activity, tastings and 2 drink tickets for the bar. 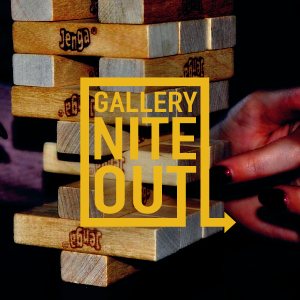 On November 1, grab a friend and sign up for this four-round team Jenga tournament in our gallery! Stack your way to the top as part of the competition, or enjoy your own non-competitive Jenga games at designated tables. Prizes awarded to 1st place and runner up! *Sign up by emailing your 2-person team by sending your team name and the names of participating members to Kim McKoy at [email protected]. 20 teams maximum. Teams can sign up at the door if space allows. Each team member must purchase a ticket.